The HQ Hydra II 300 trainer kite is the world`s first and only water re-launchable, foil kite. The HQ Hydra II lets you accomplish something no other trainer kite has ever done before. 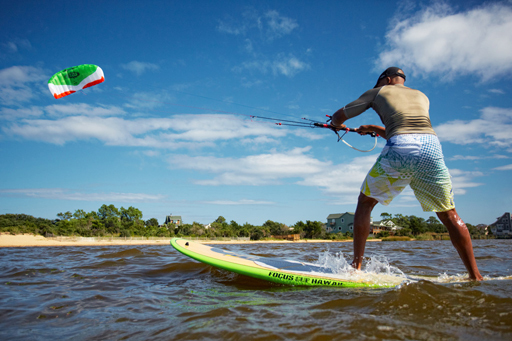 It lets you train, body drag, and do light kiteboarding in every environment including in the WATER. The Hydra 300 is the first model in the lineup and will generate moderate power in medium wind speeds. The Hydra II trainer kite is extremely stable and easy to fly in higher wind speeds. Its closed cell ram–air foil architecture it has no bladders to inflate or replace and yet it floats on water as if it was inflated. The Closed Cell system now features an internal drainage system with dirt-outs so you can remove debris. The Hydra’s bridle is stitched Dyneema for added strength. The HQ Hydra II can relaunch your fallen trainer kite in any position even backwards off the water; with just a pop of the 3rd line you will get back to flying in no time. Another feature is the third line safety system which uses the third line to fold the kite inward depowering it and letting it fall safely to earth which makes it perfect for use by absolute beginners. The Hydra 300 flies great in low winds, and generates a good amount of pull for body dragging. With its extra wide wind range the Hydra 300 is great for Kayak and paddle board sails. The HQ Hydra II 300 kite offers a unique water kite experience with the safety of a trainer kite. WeatherFlow is proud to announce the WeatherFlow Wind Meter – it’s an anemometer that fits in your pocket. It’s the first hardware product we have created for the general wind & weather addicted community. It’s compatible with iPhone, iPad, iPod, and all major Android devices. FREE DVD or KITE When You Order a HQ Hydra II Today. Not Sure Which Trainer Kite is for you? Check Out ShadeOnMe's Trainer Kite Guide and See how the HQ Hydra II 300 did. The Hydra from HQ-Powerkites is the worlds first and only water relaunchable trainer kite. This closed cell design is super easy to handle and lands and relaunches from the water.